Our Sales Consultant, sent an email tonight at 7pm on Christmas eve to give us some good Christmas news – our building project has been sales accepted by Metricon!!! In addition we were advised that the 600mm extension to the Garage has been re-instated and the previous request for an increased step down to the garage is now no longer required. We will still need to keep the reduced Outdoor Room (which is still bigger than the standard) instead of our orignal Grand Outdoor Room. We went to see the Nolan display at Mernda Village last weekend which has an extended outdoor room (approximately 1.5m). Based on the size of the decking we had in our last home, we felt that the standard outdoor room wasn’t going to be big enough for what we want and whilst we can no longer have the super dooper grand outdoor room, the 1.5m extention will still make a difference. We are now eagerly looking forward to seeing the preliminary plans and contracts early in the New Year. Merry Christmas! Fingers crossed we may be in our new home by next Christmas. Here are some pictures of the original house which is now demolished. It is a single level dwelling with 2 bedrooms, living, family, dining and kitchen. In recent years, there was an additional bathroom added on. There is also a bungalow out the back and a large pool which over the years has entertained not just the home owners but half the neighborhood too. The land size is 708sqm. Being built in the 1950’s there is some asbestos in the eaves and ceiling areas which the demolisher are aware of and have had to factor into the demolition process. Yesterday we received our timber floor sample from Boral by courier. We received 2 strips of 370mm long x 133mm wide and by joining them together we have got a nice colour sample that we can match with our other selections. The Boral Silkwood Timber Floor colour we have decided on is Blackbutt. 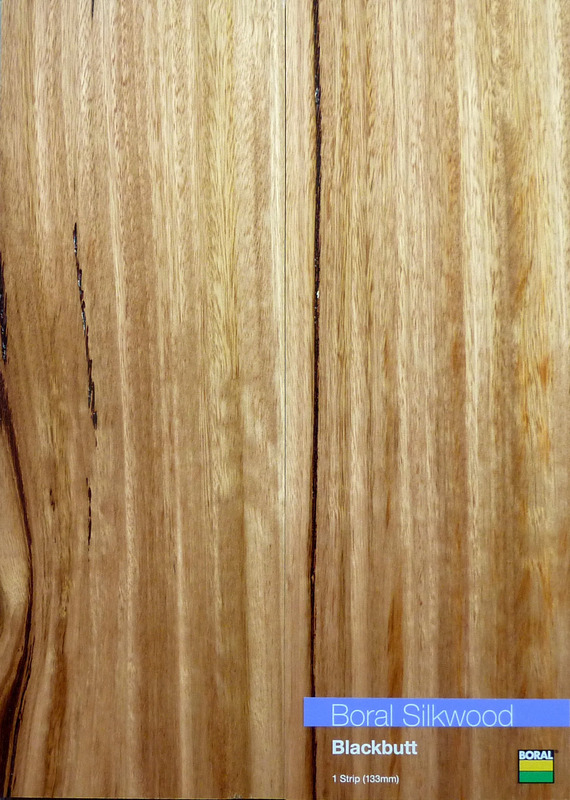 Blackbutt has a Janka hardness rating (relative measure of resistance to impact and wear) of of 9.1. The hardness rating is a consideration to ensure it is durable enough for foot traffic (and kids!) – if you go to display homes you can see dents in the floor where people have walked in with high heals. Below is the collection of samples of Laminex and Caesarstone we have accumulated over the past weeks (see previous post on larger Laminx samples). You can see underneath the samples the 2 tiles we have selected to go with for the wet areas. We now have most of the samples we need to come up with our choices…..
Today was the last full day of demolition work our property. The demolisher has done a good job. 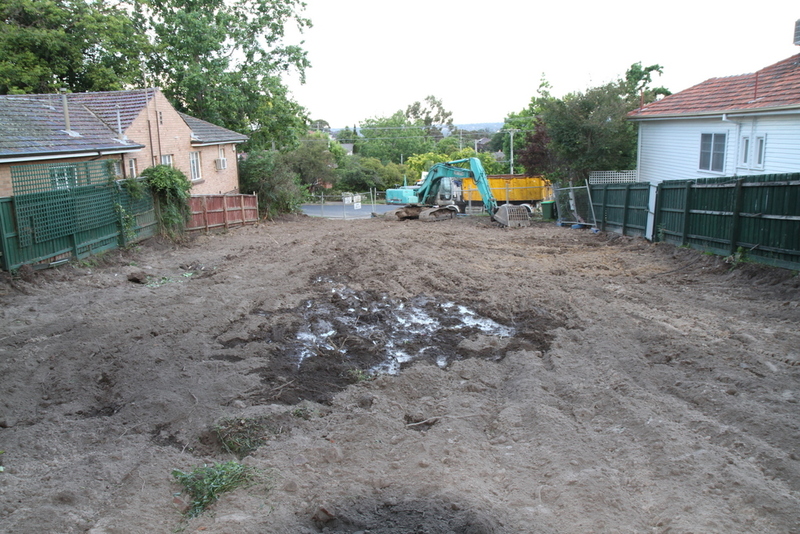 They have scraped the land so that it gently slopes up and the drop where the garage was is now filled in. There was little movement on the property over the past two days but today the demolition guys were back in action. We did a drive by the property after work today and there were 2 big trucks parked out the front. We knew there would be a lot of rubbish come from the house but it’s incredible just how much has been generated. 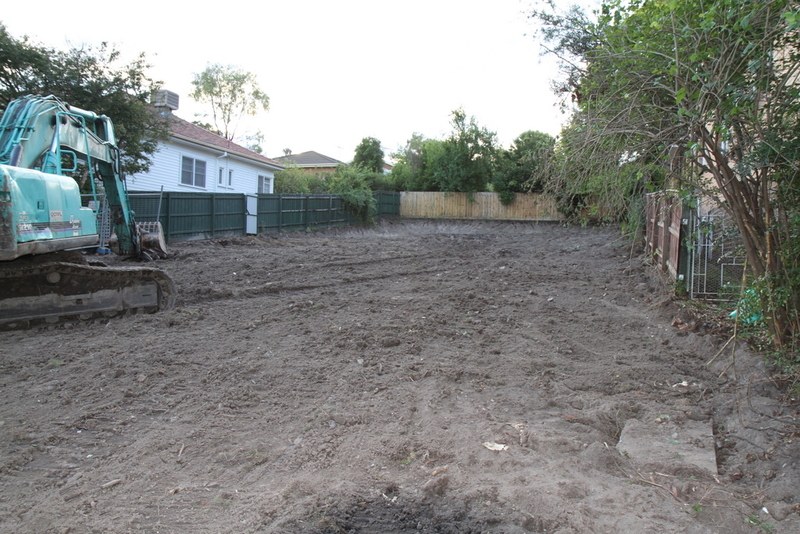 It’s great to start being able to see the block more clearly now that the house is gone. Last week we received the preliminary siting from our Sales Consultant, Melissa. The siting requires some design amendments due to driveway gradient/slope, fall on site, neighboring habitable windows and garage wall height on boundary. Deletion of eaves to the south elevation of upper floor. What was also missing on the preliminary siting is the 600mm width extension to the garage. The removal of the Grand Outdoor extension and 600mm extension to garage is a bit disappointing. As an alternative to the 3.3m extension of the Grand Outdoor Room, we have requested our Sales Consultant to include a 1m extension to the outdoor room. It seems we cannot get closer than 2324mm to the fence of the neighbour south of us due to overshadowing habitable windows and as a result a width extension to the garage is not possible. The preliminary siting shows the maximum wall height on the southern side of the building to be 5.8m to top of gutter. 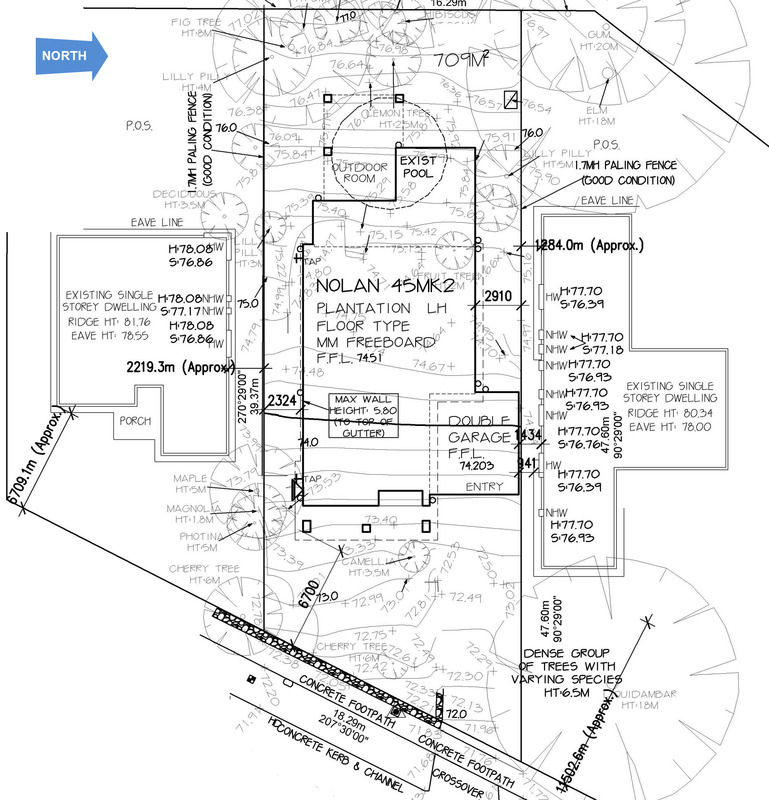 Does anyone know any regulations about how close we can get to the neighbour (reduced setback) as we would really like the garage extension even if its only nominal amount? Is it difficult to get building approval for overshadowing habitable windows? Edit [7/12/2011] – Thanks for a reader for posting a reply on HomeOne – click here to read. 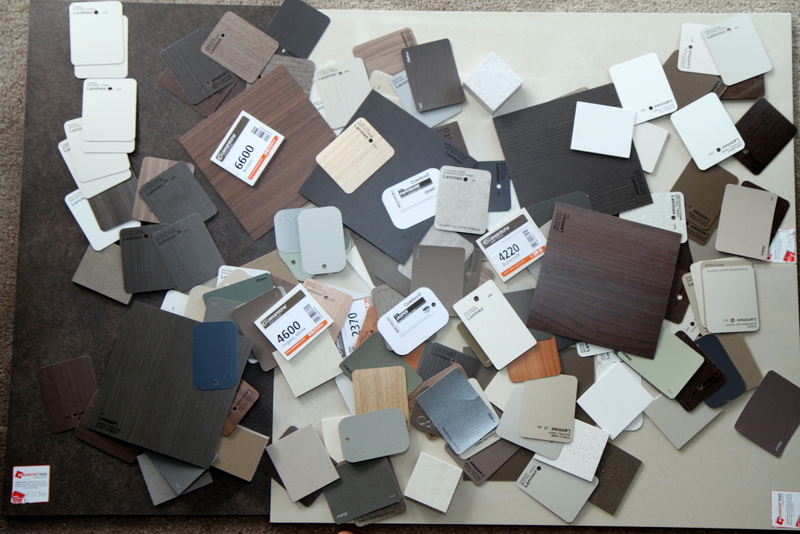 Today we took a trip to Beaumont Tiles in Oakleigh to prepare for our tile selections. Beaumont Tiles is Metricon’s tile supplier and today was our second trip to the showroom. On our first trip we took home 5 sample tiles to match with the various other colour samples we have for our benchtops and cupboards.